This is the very first Christmas tour at Bliss Cottage, owned by my friend Shelly. She has extensive collections of vintage items all through her home. You are in for a treat. I said I would do some posts just to show you all the visual treats at Shelly's house and here is part one. Shelly is the sister in law of Patty at Lemon Lane Cottage. They are all just the best. So thankful we have become friends. Okay on to the tour. This is just the kitchen folks. There is so much to look at here that it takes time to take it all in. Now this gal is a collector but let me tell you she is thrifty. So many of the cute things you see are from yard sales and thrift shops. We all want to go shopping with her to find her good places and glean some of her collecting skills. Okay on with the fun. It was getting dark so some of my photos aren't the best. This cherry valance she found at the thrift store. Can you believe that? She already collects in red so adding Christmas is perfect. She finds things and paints and modifies them to her colors. Her husband also helps her create some of her shelves and is very handy so she is one lucky gal. Her attention to detail is fabulous. I wish you could all see it in person. So fun. We think she needs a blog so she can share her place all year long. It is as cute decorated for everyday too. Her Christmas tree in the kitchen. Next time I will share the sitting area and dining room. Isn't her place fun? Thanks Shelly for generously sharing your home with us and for letting me take so many shots and share it on my blog. Adorable....even though she has the red kitchen, it has to take a while to get out all those darling decorations. It reminds me of the 50's....Enjoying the tour! You got some great detail shots. I saw things in your pictures that I don't even remember seeing when I was there!!! It was such a treat!! What a happy looking adorable kitchen, that's the look I'm going for but slowly accomplishing. This was a fun post to read and see. I saw Kris's post...it looked like you girls had a wonderful day! What a cute house! I want my house to look like that!!! What an awesome gingerbread house, I totally want to visit her, no I want to live there! Thanks for sharing with us, love it! She could open her very own store with just what you have shown us. I would LOVE to go shopping in her home. Love it! What a fun kitchen, its absolutely adorable!!! What a fun kitchen. So many fun things to look at, and I love the red and white color combination. I love this kitchen! I need to see more! I especially love the red /cherry window curtain. Simply adorable! Love it all!! Wow! I love Shelley's house. Everything feels so happy, jolly and sooo Christmas. I love the tin cans and the cherry curtains!! What a cute kitchen! Love all the red, my favorite color! I want to see the rest of the house! I love the red, too, as it's my favorite color! 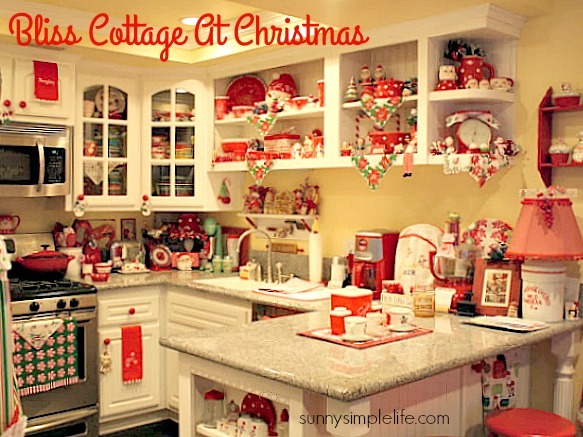 This kitchen is TOO cute...so cheery, cozy & homey!! You and Shelley like some of the same things! Her kitchen is adorable, too. I was thinking of y'all because I heard the winds were picking-up again. I hope all's well with y'all!!! Her kitchen is just darling, how fun to have a chance to see this and to take photos. I love it! Thanks for letting us see it. And please tell her thank you for me. That is very nice that your friend let you share all her lovely things with us. Yes I agree, Shelly needs a blog! Her kitchen is packed with charm, and these photos leave me wanting more. Thanks so much for sharing it with us! I am love with every single thing! Her kitchen is warm and wonderful. Her Christmas decorations are beautiful I can't believe how many pretty reds there are. I agree she needs her own blog so she can share more with us. Thank you for sharing all the lovely things with us. 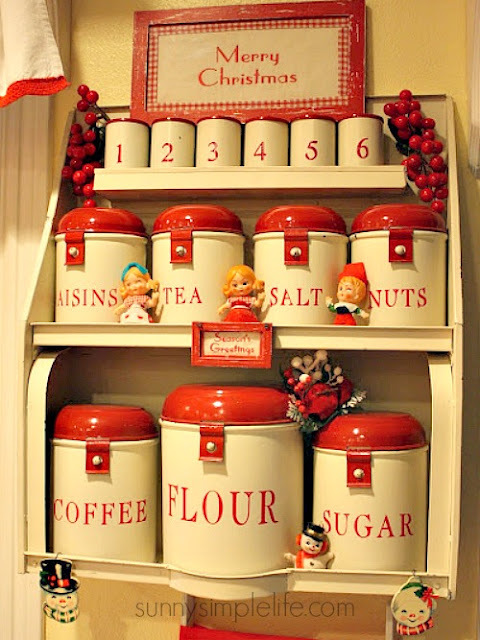 What a happy, festive, colorful and fun Christmas kitchen! The red and white palette is perfect for the holidays ... she truly outdid herself. Thanks for sharing. what a joy filled kitchen! youre right, she needs to have her own blog! thanks for sharing. Adorable seems like the perfect word here. So festive and bright, and red is one of my favorite colors. I love it all. Good morning. What a great post. I too love red and have a red and white kitchen, stop by sometime. I agree with you she should have a blog. But I'm glad you got to take pictures and post. How fun. Love seeing all this Christmas goodness especially in the kitchen. Great ideas! Wow, her kitchen is so neat and pretty. The red and white color scheme is delightful. She has put together so many festive vignettes, it must really be great to see in person. Thanks for sharing your photos! OMG!! I absolutely love her kitchen!! Mine is red too and I am always excited to see what someone else does with red in their kitchen!! I can literally sit here and just stare and stare at her beautiful kitchen. If I was in her kitchen, I would sit for HOURS..well get up and wander from one vignette to another. I am SO in love with her kitchen. I adore how she decorates. I've seen the pics of your visit you all had and I just love everything about her home...she needs a blog..that girl is awesome. two words...OH MY...I am in Love oh that is more that two words...oh well. Love the kitchen ! Yes yes she needs a blog ! I am so glad that I peeked into this post! That is an adorable kitchen. Yes, she needs to blog!! !